Book now for the best acupuncture Encinitas CA has to offer. Our experts come highly rated and have extensive backgrounds allowing us to offer the best acupuncture Encinitas and Poway, CA can offer. ActiveMed Integrative Health Center offers acupuncture specialists that practice time-tested methodologies that treat pain and a wide range of diseases. We use a mix of eastern and western medicine providing holistic solutions to diseases that are often overlooked or misdiagnosed by western medicine. We have convenient locations for acupuncture in Poway, Encinitas, and Escondido. If you’re looking for acupuncture therapy in North County San Diego, we have you covered. 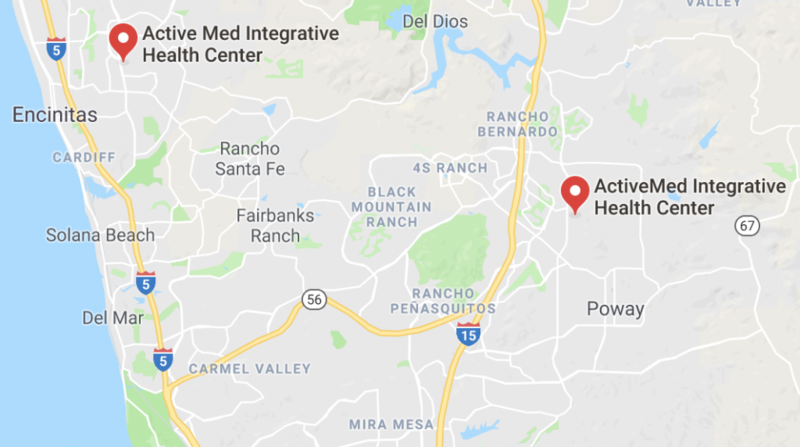 You may be familiar with our previous practice North County Health, providing top-tier acupuncture in Poway CA for over 10 years. If you want to be seen by best practitioners of chiropractic and acupuncture in Encinitas and Poway, book an appointment today! Oriental Medicine is a complete and effective system of medical treatment which has been used for thousands of years. These traditional practices are great for pain management, treating disease and promoting health and well being. Within this system, ancient natural sciences such as acupuncture, herbal medicine, tui na, structural manipulations, moxibustion, and other healing modalities, are used to rid the body of disease and restore the natural balance of health to the body. Acupuncture procedures use hair-thin needles that are inserted into specific anatomical acupuncture points located on the body to stimulate, sedate and balance certain physiological responses. Our experienced practitioners offer the best acupuncture Encinitas, Poway and Escondido can offer. People love our services. Check out our Testimonials! Your body has over two thousand acupuncture points that belong to a set of points along pathways or meridians that cover your entire body. Each one of these points has a particular effect on the function of your body and mind. When needles are placed into an acupuncture point, a signal is sent to your spinal cord, brain, organs and other tissues via channels or pathways, (some neural pathways are mimicked). The signal is point specific and creates a different effect on your body and mind when used in combinations with other points. Many physicists are aware of certain frequencies that the body emits. These acupuncture points are said to be highly conductive or reactive points on the body that affect these frequencies. Basically, when a needle is inserted at these points, there is a change in frequency at that area, which sends signals to the brain and other tissues, cells, and structures to create a desired response. Our sports medicine and pain management acupuncture is used to stimulate the healing process and decrease inflammation. Acupuncture can be used to migrate stem cells and growth factors to injured areas, hence, speeding up the healing process. There are many other varied explanations of acupuncture, more information can be found on www.acupuncture.com. WHAT CONDITIONS DO ACUPUNCTURE AND ORIENTAL MEDICINE TREAT? According to the National Institute for Health (NIH), the World Health Organization (WHO), and thousands of years of documented evidence, Acupuncture and Oriental Medicine are effective in providing care for the complaints listed below (care is not limited to these condition). Yes it does! Millions of people receive curative relief from Acupuncture and continue to receive care from their Acupuncturist when needed. It is an extremely effective system of medicine which has been utilized in many Asian cultures for thousands of years. Acupuncture is currently being practiced worldwide by millions. We have been helping people for decades not only treat their pain but reverse the underlying diseases causing the pain. Start a plan to heal with us and experience the best acupuncture Encinitas, Poway and Escondido can offer. People love our services. Check out our Testimonials! HOW MANY TREATMENTS DOES IT TAKE FOR ACUPUNCTURE TO PROVIDE ME WITH RELIEF? It depends on the nature of your complaint or problem. For some it just takes one treatment but for others it takes several more. It also depends on how long you have had the problem. Although, many people who have had extreme pain diseases for many years have received relief within just a few treatments. No, although, Acupuncture can sometimes create a warming, cooling or dull achy sensation in the body, this is usually not painful. Some people describe the feeling as tingling or slightly numbing. For those with a fear of needles, we do offer needle-less acupuncture. This type of acupuncture utilizes a machine that delivers specific frequencies into an acupuncture point. There is no discomfort and most people don’t feel anything while the treatment is performed. HOW DEEP DO YOU INSERT THE NEEDLES? It really depends on what effect the practitioner is trying to achieve. In our acupuncture service for Encinitas patients and beyond, sometimes the physician touches the needle to the surface of the skin, and other times the needles are inserted to a deeper level. Our experienced practitioners offer the best acupuncture Encinitas, Poway and Escondido have to offer. People love our services. Check out our Testimonials!